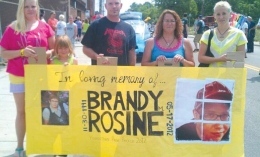 Holding a banner are the loved ones of Brandy Stevens-Rosine, who was murdered in May. Kevin Gold stands with his two daughters (left; Carrie Rosine, his girlfriend and Stevens-Rosine’s mother; and Stephanie Rosine, her sister. Photo courtesy of Krysti Horvat. The morning that Youngstown State University junior Krysti Horvat learned her former neighbor, 20-year-old YSU student Brandy Stevens-Rosine, had been murdered, she knew she wanted to help in any way she could. Since Stevens-Rosine’s death in May, Horvat has been selling bracelets in order to purchase a granite bench in her memory, which would be located in either Boardman Park or on YSU’s campus. The bench would cost around $2,000. So far, Horvat has raised around $650 through the sale of colorful bracelets. Horvat started small, ordering only 100 wristbands. Demand grew quickly, and she ordered more. “The response is strong, and I don’t see it lightening up any time soon, especially with the trial likely to happen next April or May,” Horvat said. Jade Olmstead, 18, and Ashley Barber, 20, were charged with the murder. Horvat’s family donated $100, but close friends and family aren’t the only ones touched by Stevens-Rosine’s story. A stranger in California contacted Horvat after a pretrial hearing in June, when she saw the story on the Huffington Post. The woman donated $45. Horvat has been asking for $3 for each wristband, or two for $5, but others have been much more generous. Horvat said Stevens-Rosine grew up in the house behind her father’s. They were friends for seven years. Stevens-Rosine was cremated, so both Horvat and Stevens-Rosine’s mother, Carrie Rosine, would appreciate a memorial bench or gathering space. Horvat has a difficult time coping with the loss of her friend. “I try not to focus on the negatives, but the positives that can come of it — like Carrie’s decision to start a scholarship fund in Brandy’s name,” she said. Fliers, the blog and word of mouth are Horvat’s way of promoting the bracelets with Brandy’s name on them. Horvat also hopes to take part in this year’s Oktoberfest in Boardman Park with the Victims of Violent Crime. Horvat and Rosine are planning a spaghetti dinner benefit and a night with several local bands that Rosine-Stevens knew to help raise money for the memorial bench.